For a liberal like me, it’s hard not to be cranky after Donald Trump’s TKO (i.e., Electoral College) defeat of Hillary Clinton. 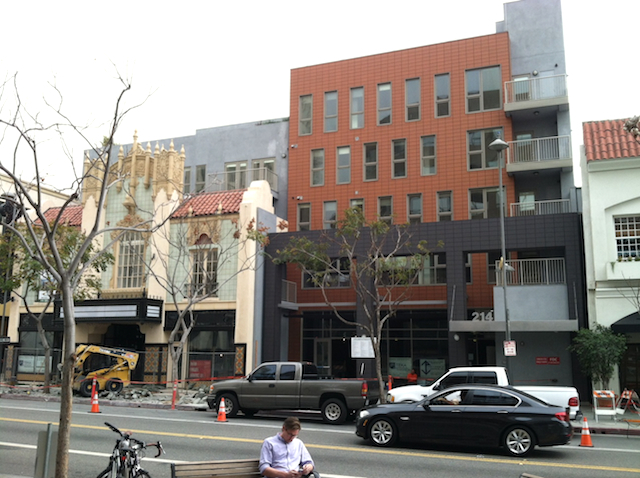 True, my mood was elevated somewhat by the local KO of Measure LV, but it took another hit when I turned my attention to the political issue of the day in Santa Monica, namely the Downtown Community Plan (DCP) now under review by the Planning Commission. The latest draft of the DCP, issued in February, is the product of what is looking to be a never-ending sequence of planning processes. These began a dozen years ago with the start of what was supposed to be a two-year process to revise the land use and circulation elements (LUCE) of the City’s general plan. The LUCE took six years of process before the City Council adopted it in 2010. Updating the Zoning Ordinance then took another five years (2010-15). During that time the City began the process to fill in a major gap left open in the LUCE, namely downtown Santa Monica (DTSM), and the draft DCP is what we now have for those efforts. After Planning Commission review, and further revision, the DCP is scheduled to come before City Council next spring. The fourth revision? As noted in the report on the DCP that planning staff prepared for the Planning Commission meeting Nov. 16 (after holding hearings that night, the Commission will again take up the DCP at its meeting next Wednesday, Dec. 7), the DCP has “been the subject of citywide discussion for the past five years.” And we’re supposed to update it every five years? Should we start the “citywide discussion” now for the 2022 update? And note: it’s taken five years (and we’re not done yet) to plan for 20 years of development of only about 44 blocks, most of which already have buildings that are unlikely to be replaced for decades, or even this century. Naturally, “citywide discussion,” what we’ve been having for five years, is a euphemism. For what (you ask)? Well, primarily for an out of control process that wastes everyone’s time. But that’s not the whole story. At the heart “citywide discussion” is a euphemism for elected officials not having the courage to let city staff plan, goddamn it, and then demand that staff give them something to vote on. No, I don’t blame the hard-working and abused-by-the-public planners who drafted the DCP for the years-going-on-decades of “conversation.” I blame the electeds, and the succession of city managers since 2004, who themselves know plenty about planning, and could probably write the documents themselves, but who are afraid to make decisions without cover of meeting after meeting. These meetings go nowhere, because they are designed to placate people who are opposed to change in any form, including the reasonable evolution of our downtown, people who will never be satisfied or persuaded by anything, let alone by more “conversation.” The City Council wants to placate the un-placatable, residents unhappy with change who don’t like downtowns and urban life in general, and don’t like our downtown in particular, what with its horrid tourists and young, happy, and “transient” apartment dwellers. Memo to council members, to the Planning Commission, and to the City Manager: those residents you are trying to persuade to be happy with change have told you time and again that they won’t be persuaded. They will never be happy with any change that they imagine will add to traffic or that won’t restore the sunny days of their youth. Why don’t you cut the farce about pleasing them and get back to planning and deciding? At what point will you stop trying to make people love and respect you who at best look down their noses at you (Santa Monica Coalition for a Livable City) or at worst despise you (Residocracy)? Memo to council members: given (i) that anti-development targets Pam O’Connor and Terry O’Day both won reelection without SMRR endorsements, (ii) that when all the votes are counted no-growther Armen Melkonians will likely have received votes from fewer than 25% of the number of Santa Monicans who voted this year, (iii) that yet again no candidate running on an anti-development platform has won election without a SMRR endorsement, and (iv) that RIFT and LV both lost decisively, is it too much to ask you to stand up and end our long municipal nightmare of perpetual planning? I.e., make some decisions instead of calling for more process? Memo to council members and planning commissioners: If you believe that the charm and character of downtown will be destroyed if you allow buildings taller than 60 feet, fine. Vote that way. But can you finally vote? I.e., make decisions? Without fearing that the people will withdraw their love for you? Finally, delay has substantive impact. The circumstances, economic, political, and otherwise, in which the LUCE process began in 2004 were quite different in 2010 when the LUCE was adopted, so much so that the LUCE was an artifact the night the council passed it, largely doomed not to be implemented. Did I say I’m cranky? Next time I’ll do some substantive analysis of the DCP. In the meantime, thanks for reading. I spend too much time on Facebook, but I have learned a few things there. One is that there’s a disconnect between local politics and the other kind. On Facebook there’s a daily conversation among a few hundred avid followers of and participants in Santa Monica politics. In the ocean of Santa Monica voters, we Facebook posters (and lurkers) are only a few fish, but the volume of the stream of consciousness can approach the flow of a river and the decibels of a waterfall. The discussions can become, or even start out, heated. But what’s funny is that when it comes to national politics—namely, the presidential election—nearly all the Santa Monicans violently “commenting” at each other about the City Council, or Measure LV, or any other local thing, find themselves in agreement that electing Donald Trump would presage the apocalypse. I might read a post from a Residocracy member that drives me crazy, but if I click on another link I might find out that this same person just posted a video about why Hillary Clinton should be president. This doesn’t mean that all Residocracy members or other supporters of Measure LV are liberals like me, as some of them don’t support affordable housing and from some of their posts one can detect various reactionary or libertarian views. Nor, by the way, are all opponents of LV liberals—it’s not surprising that there are property or business owners, who oppose LV, who are conservative. What one often notices from the pro-LV posts is an attempt to fit LV into a liberal, progressive ideology. Many LV supporters are convinced that stopping the building of market rate apartments will keep housing prices down. Their logic seems to be that because developers can charge high rents for the new units the rents on the new units will increase the average cost of housing in Santa Monica. That logic is convoluted, but okay, it’s a logic. I don’t doubt the liberalism of these anti-development Santa Monicans. The reason I don’t is that one can sense the anguish they feel when they are confronted with evidence that progressive opinion favors infill development in existing cities, like Santa Monica, to create livable, attractive cities that retain and attract investment that would otherwise go to sprawl. I.e., favors what LV opposes. There’s big cognitive dissonance when people who consider themselves progressive, especially Baby Boomers who were on the barricades in the ’60s, hear over and over that they are on the wrong side of history when they demonize urban development. On Facebook, you can practically hear the gnashing of teeth. The progressive arguments favoring cities against sprawl began as a reaction against the negative consequences of suburban development. The Sierra Club, for instance, first adopted policies favoring infill development 30 years ago. Around the same time movements like New Urbanism and Smart Growth began to preach an anti-sprawl gospel that celebrated traditional urban neighborhoods. Like the proverbial ocean liner, the course of urban policies took a long time to correct, but the speed in the direction of good city building and away from sprawl is accelerating. Our president, Barack Obama, has always favored urban investment as opposed to suburban development. Back in February 2009, shortly after taking office, he told an audience in Florida that, “[t]he days where we’re just building sprawl forever, those days are over.” Many of the President’s policies during his eight years in office have supported better urbanism, and last month his administration published a “Housing Development Toolkit” that combined explanations of many progressive urban policies in one document. Local policies acting as barriers to housing supply include land use restrictions that make developable land much more costly than it is inherently, zoning restrictions, off-street parking requirements, arbitrary or antiquated preservation regulations, residential conversion restrictions, and unnecessarily slow permitting processes. The accumulation of these barriers has reduced the ability of many housing markets to respond to growing demand. While the housing market recovery has meant growing home values . . . barriers to development concentrate these gains among existing homeowners, pushing the costs of ownership out of reach for too many first-time buyers. Space constrained cities can achieve similar gains [in housing], however, by building up with infill, reducing the eyesores of empty lots and vacant or rundown buildings that go undeveloped in highly constrained regulatory environments. Unsurprisingly, many cities with the highest local barriers [to building housing] have seen increases in homelessness in recent years, while nationwide homelessness has been sharply in decline. The fact that liberals and progressives who support LV and similar anti-development policies are at odds with current liberal and progressive policies doesn’t mean that one should not be skeptical about those policies. One should always be skeptical; today’s pro-urban policies exist only because of skepticism about policies that were once considered progressive and had government support, such as urban renewal, modernist public housing blocks, and conventional suburban development. Those policies created new problems, and those problems required new thinking. But to be progressive one has to believe in progress. You can’t be progressive if you favor nostalgia and fear change. But progress is conservative in that it must be based on trial and error, i.e., learning from one’s mistakes. Today’s progressive urban policies weren’t created from thin air. They arose from analyzing the mistakes of generations past, such as modernist planning (urban renewal, freeways, etc.) or conventional suburban development. We can’t predict the future, but we can avoid making the same mistakes that previous generations made. One of those mistakes was building sprawl instead of investing in our cities. The New York Times reported on Sunday that the number and intensity of national and international crises over the holidays was low enough that President Obama could, for the first time since becoming president, enjoy a relaxing family vacation in Hawaii. I felt the same way about news in Santa Monica. Sure there was news, notably the reversal by city staff on the City’s obligation to preserve the Chain Reaction sculpture, but not too much. Like the president I took a vacation (in his case, from preserving national and world order, in my case, from blogging about Santa Monica). I’ve never been to Hawaii, but it can’t be better than Santa Monica in winter. As for what news there was, I am more than curious about what response the Federal Aviation Administration (FAA) will make to the City’s airport lawsuit. The deadline is this Friday, Jan. 10; as reported in The Lookout, Federal District Judge John F. Walter denied the FAA’s request for a longer extension of time to respond to the complaint. Notably Judge Walter accepted the City’s contention that time was of the essence, given that the City wants to know what its rights are before July 1, 2015, the date its 1984 agreement with the FAA expires. I’m not reading any tea leaves based on that, but if the FAA moves to dismiss the lawsuit (which is what, according to the Lookout article, City Attorney Marsha Moutrie expects), there may soon be a hearing on the merits, as the City will have to prove to the judge that it has a cause of action suitable for “declaratory relief” (which means asking the court to make a decision before there is an actual conflict between the parties). How the judge would rule on that would, needless to say, be an indication about the strength of the City’s case. One analytical thing I did do over the holidays was to try to catch up with outside reading. While Santa Monica has many unique or at least unusual circumstances, sometimes we consider ourselves more in control of what happens here than we are, and forget the context in which the city exists. I like to read about the context. To that end, there’s a newsletter that I subscribe to called Better! Cities & Towns (BCT), which covers urban planning and development. I like BCT because while it focuses on real-world projects it also publishes articles with relevant data about what’s going on in America. The December issue was a particularly good one. Take, for instance, the issue of making developers build more family-friendly housing instead of the singles and one-bedroom apartments they want to build. There’s a sense that this problem arises from a self-willed decision by the developers not to build bigger units — based, according to some, on greed. But what if developers (motivated, it goes without saying, by profit) were merely responding to a market for smaller units that is the result of demographic change? According to an article in the December BCT, “Demographic Wave Transforming the Market,” that is exactly what is happening. The article presents forecasts from a new book, Reshaping Metropolitan America, by Arthur C. Nelson, a planning professor at the University of Utah who has been studying cities for 30 years. According to the forecasts, which are consistent with other studies, between 2010 and 2030 the U.S. will add about 26.3 million households, but the net number of households with children will increase by only about 3.5 million, meaning that the number of households without children will increase, on a net basis, by almost 23 million. Of that increase, nearly 14 million will be single-person households. There is also data showing that the average number of children in households with children is declining. While these households with no or few children will be located everywhere — in cities, in suburbs, and in rural areas — due to the boom in housing in far-flung suburbs before the 2008 crash, and due to empty nest Baby Boomers vacating their homes, there is and will be a large existing inventory of family-friendly homes, located mostly in the suburbs. While some new single-family homes will be built, they can’t be built in already-developed urban areas, like Santa Monica, where all lots in R-1 zones already have houses. This doesn’t mean that Santa Monica should not seek to get larger, family-friendly apartments and condos built, with amenities that will attract families who don’t want to move to the exurbs and can’t afford to buy existing single-family homes here from downsizing Baby Boomers. We need to make sure that Santa Monica continues to have a full-range of housing types and a community that is diverse by every standard – that diversity is part of our history and part of what makes us a great place to live. But we won’t get that unless we understand the demographic changes that make America a different place from what it was 50 years ago, and why it is that developers today can rent or sell all the small units they can build. On another subject, some of those opposed to development in Santa Monica are so skeptical of any benefits coming from development that they assume that any politician who votes for even the most regulated developments must be on the take or otherwise beholden to developers. Many also believe that development creates costs that taxpayers have to bear. But two articles in the December BCT show how in-fill developments economically benefit cities. One article, “Smart Growth Costs Less, Yields more Revenue for Cities and Towns,” reported on a study summarizing 17 separate studies around the country showing that infill urban development results in lower capital costs for cities, lower costs of providing services, and higher tax revenues. One study found, for instance, using data from Raleigh, North Carolina, that a six-story downtown building produced 50 times the property tax as a Walmart, and that even a three-story residential building produced more property tax than a major shopping mall. Another article, “Per-acre Tax Advantage is Persuasive Across the Political Spectrum” shows how compact, walkable places generate higher land values and taxes per acre, and lower per acre infrastructure costs; for instance, one study showed that “mixed-use downtown development takes three years to pay back infrastructure costs, while a suburban counterpart takes 42 years.” The title of the article refers to the fact that for the first time both liberal (from the organization Smart Growth America) and conservative (from the Cato Institute) analysts are coming to the same conclusion, that the costs of both capital infrastructure and the delivery of governmental services are lower, and tax revenues are higher, in infill urban developments as opposed to suburban developments. This doesn’t mean that development, like all economic activity in the complex world we live in, doesn’t need to be regulated, but in an era when cities are going bankrupt and even those cities that are solvent are struggling to provide services (and, yes, fulfill their real obligations to fund pensions), do you think that those responsible for a city’s budget – both politicians and staff – need to be bribed to take a look at proposals to bring more investment into their towns? Or do you think that maybe they’re doing their jobs?